Democrat Joe Donnelly has 48 percent support among likely voters, while Republican Mike Braun gets 46 percent. 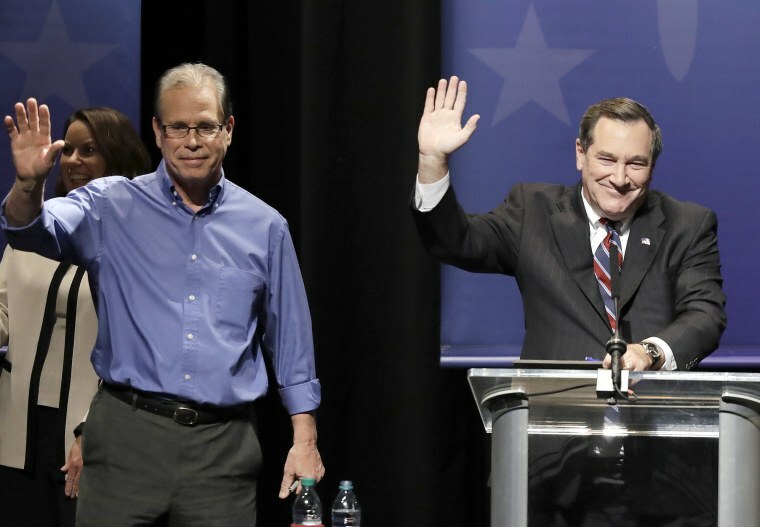 Democratic Sen. Joe Donnelly and Republican challenger Mike Braun are running neck-and-neck in Indiana’s important Senate race, according to a new NBC News/Marist poll of the state. Donnelly gets support from 48 percent of likely voters, while Braun gets 46 percent; 7 percent are undecided or prefer someone else. Donnelly’s narrow 2-point advantage over Braun — well within the poll’s margin of error — is down from his 6-point lead in September, 49 percent to 43 percent. When the ballot expands to include Libertarian Lucy Brenton, Donnelly holds a 3-point lead over Braun, 45 percent to 42, with Brenton receiving 7 percent. Donnelly’s advantage last month in this three-way race was by the same margin — 3 points. The new NBC/Marist poll identifies 14 percent of the likely voters in this contest to be persuadable — meaning that they are either undecided or leaning to a particular candidate but might change their minds. “Although Donnelly has a numeric 3-point edge over Braun, the proportion of persuadable voters is nearly five times greater than the margin that separates the candidates,” says Lee Miringoff, director of the Marist College Institute for Public Opinion, which conducted this survey. In the head-to-head matchup among likely voters, Donnelly leads with nonwhite voters (72 percent to 21 percent), independents (54 percent to 31 percent), those under the age of 45 (53 percent to 37 percent) and women (50 percent to 44 percent). Braun, meanwhile, is ahead among those ages 45 and older (51 percent to 44 percent), whites (49 percent to 44 percent) and men (48 percent to 45 percent). Both candidates are less popular than they were in September. Forty-six percent of likely voters view Donnelly positively, while 38 percent see him in a negative light (+8) — down from his 48 percent positive, 31 percent negative score (+17) last month. By comparison, 41 percent view Braun favorably, and an equal 41 percent view him negatively (even) — a decrease from 39 percent positive, 32 percent negative last month (+7). Fifty percent of likely Indiana voters approve of President Donald Trump’s job performance, while 42 percent disapprove. In September, Trump’s rating was 48 percent approve, 46 percent disapprove. Republicans hold a 7-point lead in congressional preference, with 50 percent preferring a Republican-controlled Congress, and with 43 percent wanting Democrats in charge. Last month, Republicans held a 5-point lead here, 47 percent to 42 percent. Trump won Indiana in 2016 by 19 points. Finally, Supreme Court Justice Brett Kavanaugh is popular in Indiana — unlike in blue and purple states. When asked about Kavanaugh, 40 percent of likely voters say they are more likely to vote for a candidate who backed the Supreme Court justice (like Braun did), while 33 percent say are more likely to vote for a candidate who opposed Kavanaugh (like Donnelly did). The live-caller NBC/Marist poll of Indiana was conducted Oct. 24-28 among 931 adults (with a margin of error of plus or minus 3.9 percentage points) among 800 registered voters (plus or minus 4.2 percentage points) and 496 likely voters (plus or minus 5.5 percentage points).